Double sconce with ship motif, circa 1920s. Sconces with ship motif, circa 1920s. Sconces with acanthus bobeche and etched galleon backplate, circa 1920s. Original finish. 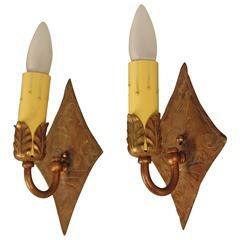 Pair of sconces with acanthus motif, circa 1920s. Original finish. Sconces with arrow motif backplate, circa 1920s. Vintage musical motif double arm sconce, framed, circa 1930 custom mounted on neoclassical painted parcel. 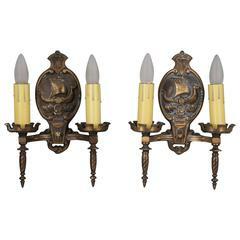 A set of four bronze midcentury Aztec-motif two-arm sconces. Sold per pair. Measurements: Height 11" Width 9.5" Depth 3". Double bulb sconce with brass backplate. Multiples available. 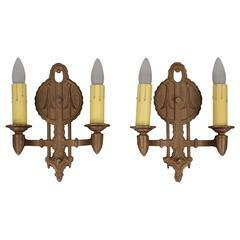 A set of eight circa 1920s English cast bronze sconces with a light silver plated finish. Foliage motif, original patina. Measurements: Height 14" Width 11" Depth 8". 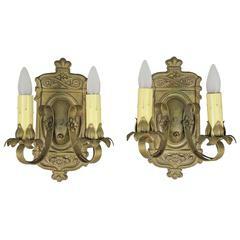 1970s pair of Spanish five-arm iron sconces headed by a large fern leaf and other floral motifs.